Craftin' Caro: Cute little animals, perfect for a little girl! Cute little animals, perfect for a little girl! 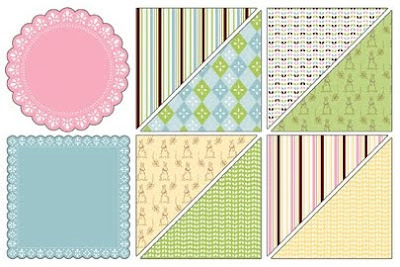 Oh, I sure had fun on Saturday afternoon working on my cards for this week's upcoming Baby/Kids card class! I pulled out my trusty Fox & Friends" set with all those sweet little animals and began working on a design. The colour combo I chose to work with was So Saffron, Pretty in Pink and Chocolate Chip. Nursery Suite Specialty Designer Series Paper so that's where I started from. The pretty striped paper just seemed like the perfect match for what I had in mind -- kind of like wallpaper in a little girl's room! The animals were each stamped on Whisper White cardstock and then punched out using the Square Scallop punch. I mounted them on the front of the card using Stampin' Dimensionals, just to give a little bit of added lift. The sentiment comes from Everything Nice", a set of 4 that I pull out often for birthday & wedding cards. Last but not least, I used our beautiful Flower Brads as embellishments, one from the Neutrals pack and one from the Subtles. Each attendee of my Wednesday class will also receive an assortment of the Flower brads, so that they get one each of ALL the colours from all 4 colour assortments. Really cute Caro!! Love the soft colors! OMG that is so cute. I was gonna go to the gym today but I think you've inspired me to stay home and be a little crafty. I'll go to the gym tonite! I will agree. Those cute little animals are perfect for a little girl. I will show this card to my daughter and I am sure that she will love this card.